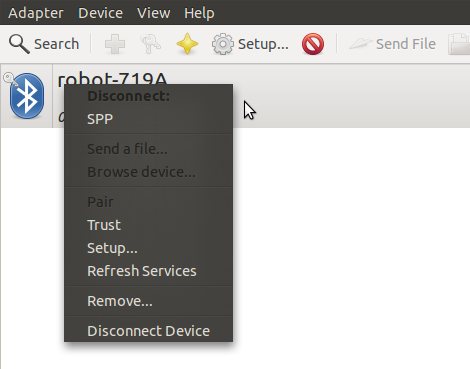 A quick post on how to set up the Bluetooth communication between Ubuntu and a BlueSMIRF Modem. Details on the commands available are available in the Roving Networks Command datasheet. I didn’t get the default Ubuntu Bluetooth tool (the B in the taskbar) to play nice with the BlueSMIRF, so I installed “Bluetooth Manager” (BlueMan) through the Software Center. Power the BlueSMIRF, it should start blinking rapidly for about a minute. This means it is waiting for a connection. Once the rapid blinking stops, you can’t connect anymore! Because this is the first time you connect to the BlueSMIRF, it needs to be paired. Therefore, Blueman will ask you the pass phrase. Enter “1234” (without quotes), this is the default passphrase of the BlueSMIRF. The LED on the BlueSMIRF should turn green. That’s it! Now the pairing is done, and you won’t need to enter the passphrase the next time you connect to the BlueSMIRF. , but running after the robot with the laptop in my hands kind of diminished the James Bond – feeling of it. Therefore, I decided that my first application I would create for my brand new Android smartphone would be a remote control for the robot! Luckily, the online developer information (available at http://developer.android.com), provides a wealth of information for getting started. What was more, I actually found a sample application there, called BluetoothChat, that almost did exactly what I wanted to do. 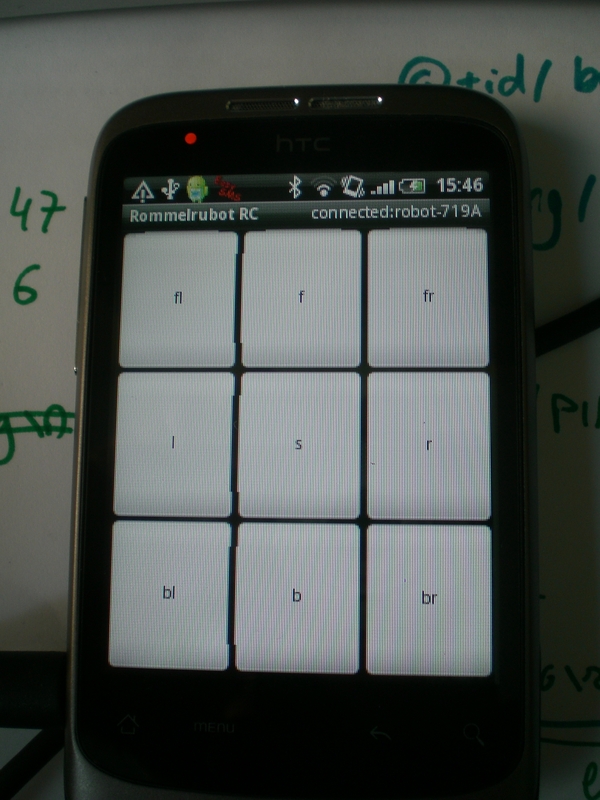 The BluetoothChat application makes a connection to a Bluetooth device (this will be the robot) and it allows to send text to it once connected (the text will be the robot commands). And this worked! Also, note that you have to connect at 57600 baud to the Android Bluetooth. 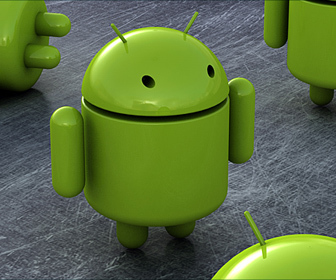 Android receives this, and knows the connection is succesfully established. Now Android can send commands like “D,70,1” to set the servo to 70° and the drive motor to forward motion. I changed the run() method of the ConnectedThread to do the handshake once connected: see code. And now a little movie to prove that it works! 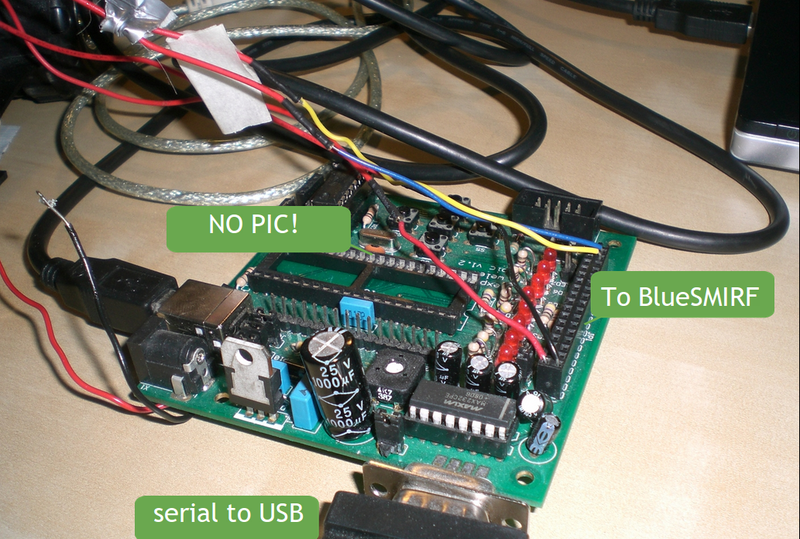 My last post was about putting Bluetooth in a flea market toy car in order to control it remotely from my laptop. One problem I had with the car was the amount of current it drew. Unexpectedly, it turned out to be the steering that drew most of the current. 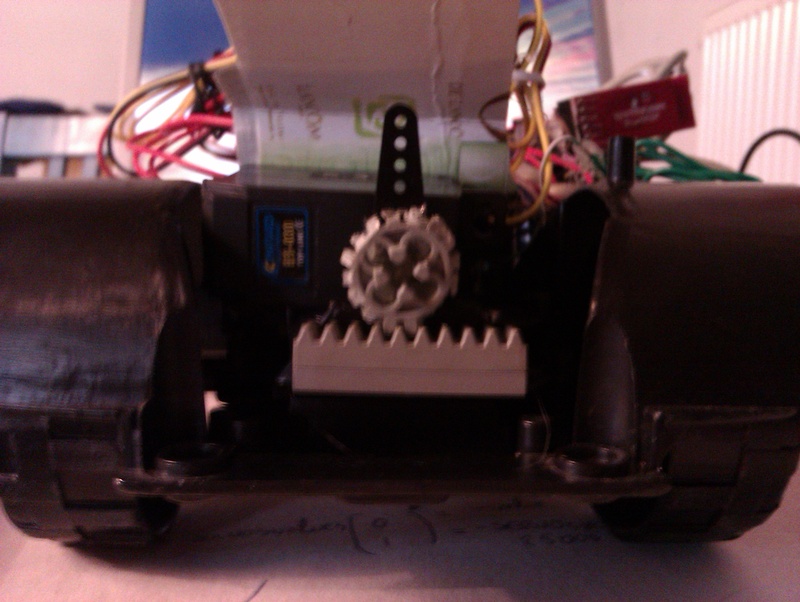 I thought the steering was done by a servo motor, but apparently they put a regular DC motor in it to turn the weels. A piece of plastic stops the turning and basically the motor stalls everytime you steer, and so draws the maximum amount of power..
To reduce the power-demands of the car I cut out the steering DC motor (and all the plastic around it) and glued in a servo. Now to make the servo turn the weels, I used some good old Lego bricks. The flat one with the dents is glued to the thing that used to make the weels turn. Than I used a gear wheel glued to (God, I love hot-glue!) 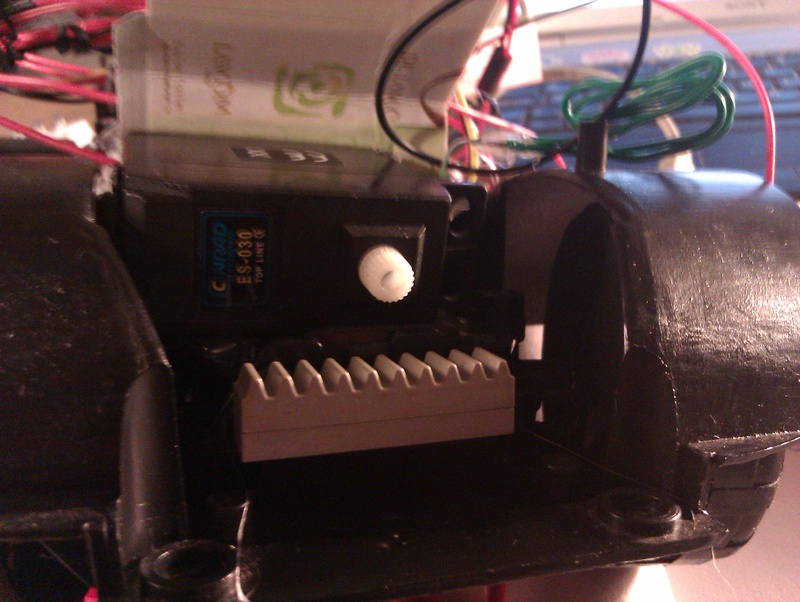 the servo, which makes the flat brick move. Because the servo sometimes turns too much (it’s a cheap one so not always that accurate), I cut most dents from the gear wheel. This assures that no damage is done if the gear wheel turns too much.. In the setup routine I connect to the serial port at 115200 bauds. 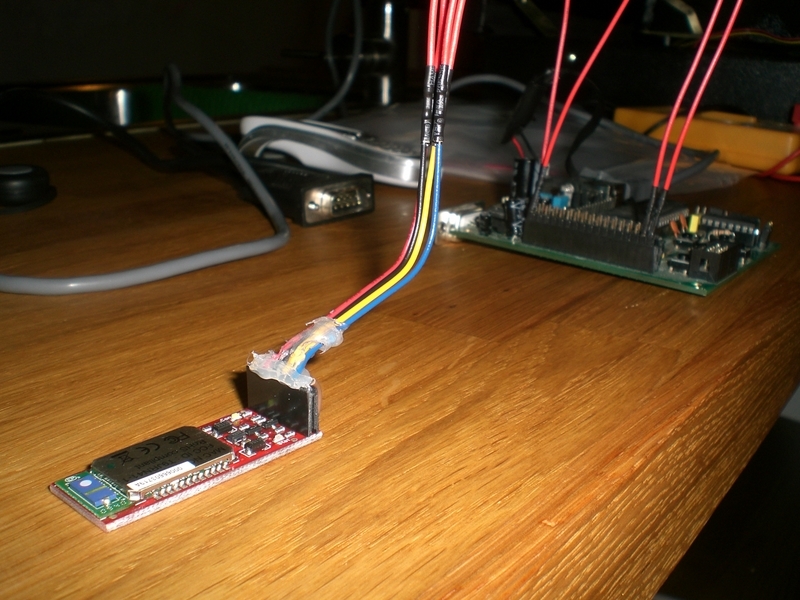 The bluetooth module is just used as a regular serial cable, so no fancy tricks are necessary.